Pre-Register to Attend! Only $10! - Limited Edition 4-pack of DCSC buttons/pins! - Limited Edition Summer Scoot Embroidered Patch! - and lots of goodies provided by our great sponsors! Pick up your Rally Pack Saturday, July 1 at Noon! 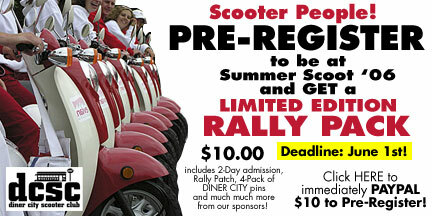 FREE admission to all of Summer Scoot '06. Sponsors: Get YOUR Stuff in the Rally Pack! Contact Tim Faucher for more details!